Apple’s New HomePod Speaker to Release on February 9th | MB Magazine UK | Discover the latest in technology, reviews, guides & features. Apple plans to release its new HomePod speaker on February 9th, with preorders available late this week. The HomePod is Apple’s new smart speaker — a voice-activated speaker aimed at the premium home audio market. Priced at $349, it’s a sleeker, smarter and better sounding alternative to the inexpensive voice-activated speakers released by Google and Amazon over the past two years. Designed for “stunning” audio quality (as Apple puts it), HomePod is designed to combine with an Apple Music subscription to provide access to a huge variety of albums, podcasts, playlists and other audio content. The smart speaker can also combine with Siri to deliver messages, check the news, provide weather information and set timers. It also links to a variety of HomeKit smart home devices, providing voice-activated control. As you’d expect from an Apple product, HomePod is sleek and beautiful. It’s small, at under seven inches in height, and easy to move around the home. The speaker features six small microphones to direct voice from any direction, even in noisy environments. From an audio perspective, it contains seven beam-forming tweeters arranged for clear, high quality mids and highs, as well as an Apple-designed woofer. While it’s by no means a serious audiophile speaker, Apple has clearly made sound quality a major priority. It also uses spatial awareness to deliver sound specifically where it’s required the most, taking walls, corners and obstacles into account in order to provide optimal audio quality. Apple plans to allow support for multiple HomePod units to be used in stereo in a future software update. Apple will also release an update providing multi-room audio support, which is planned for later in 2018. Designed specifically for use with Apple Music, HomePod automatically learns preferences and tastes based on usage patterns across iTunes and Apple Music on multiple devices. There’s full HomeKit support, as well as support for third-party messaging apps through SiriKit. Apple’s smart speaker is clearly aimed at taking on Sonos, which has earned praise as one of the world’s top voice-activated speaker brands. However, HomePod is priced at almost double the cost of Sonos’s competing One speaker system. 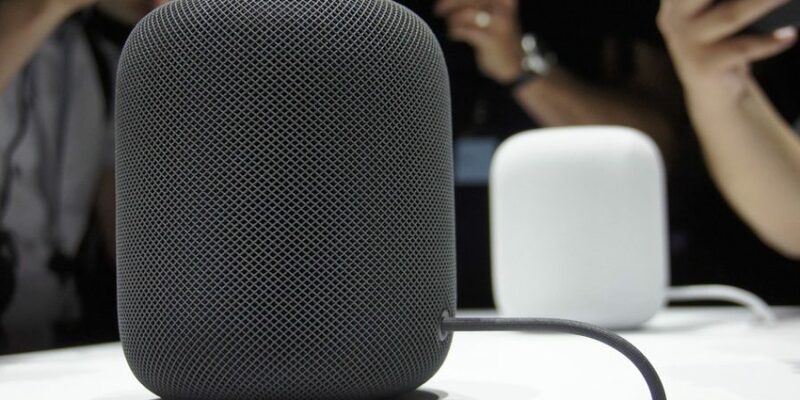 Originally planned for a 2017 release, Apple delayed the official launch of the HomePod in the middle of December, causing the company to miss the lucrative holiday shopping season — a major sales period for manufacturers of smart speakers and other consumer electronics. The current HomePod is much the same as the original product displayed at the WWDC in June of 2017, with no noticeable changes. Despite this, Apple is entering into a rapidly growing market. Data from Technavio indicates that the smart speaker market will grow at a compounded annual rate of 24% by 2021 as consumers become more aware of the benefits of smart speaker and home automation technology. Given Apple’s reputation for eye-catching, stylish home devices, its entry into the smart speaker market is a welcome development. For users seeking a premium alternative to existing options from brands like Sonos, HomePod could certainly be worth considering.